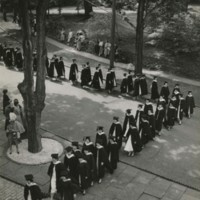 Image of the commencement procession in 1956 at Bryn Mawr College. 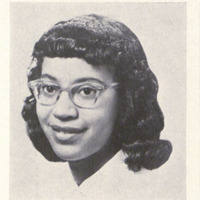 Photographer unknown. 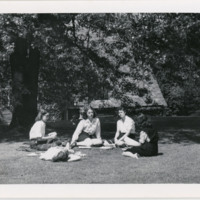 Five students study in the Cloisters, four sitting on the grass, and one seated on a low wall leaning against a column. 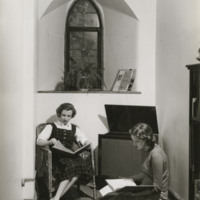 All are reading. 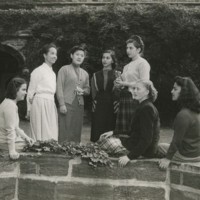 The wall and colum are thickly covered with ivy. 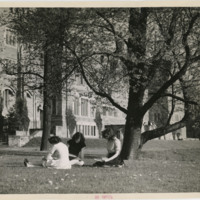 Three students sit ouside under a tree reading, with Rhoads Hall in the background. 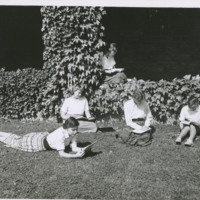 See 112: Five students under tree, sitting and socializing, one is knitting, another reading from a paper, and one is lying down. 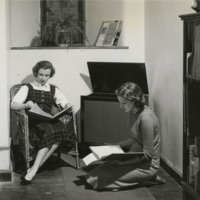 The other two are not doing anything. 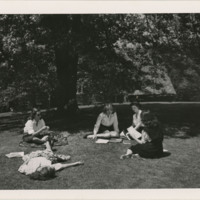 See 116: Five students under tree, sitting and socializing, one is knitting, another reading from a paper, and one is lying down. The other two are not doing anything.